Astronomers have discovered two rapidly rotating radio pulsars with the Low-Frequency Array (LOFAR) radio telescope in the Netherlands by investigating unknown gamma-ray sources uncovered by NASA’s Fermi Gamma-ray Space Telescope. The first pulsar (PSR J1552+5437) rotates 412 times per second. The second pulsar (PSR J0952-0607) rotates 707 times per second, making it the fastest-spinning pulsar in the disk of our Galaxy and the second-fastest known spinning-pulsar overall. Pulsars are neutron stars, the remnants of massive stars that exploded as a supernova, which emit radio waves from their magnetic poles that sweep past Earth as they rotate. As a result, they act like lighthouses where we see pulses of radio emission for each rotation. Neutron stars are the size of a city packed in more mass than the Sun. That’s why they are used to study the behaviour of matter under extreme densities. By studying the fastest-spinning pulsars, astronomers hope to discover more about the internal structure of neutron stars and the extremes of the Universe. 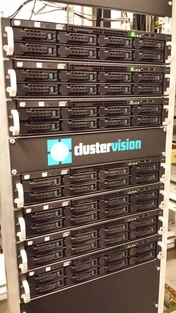 This cluster is funded through an ERC starting grant to Jason Hessels from ASTRON and the University of Amsterdam. Two papers detailing Pleunis’ and Bassa’s pulsar discoveries will appear in The Astrophysical Journal Letters on 5 September 2017. Hanging out in a binary system with a hot millisecond pulsar can be hazardous to your health! A new study has examined how these perilous objects can heat and evaporate away their companions. Millisecond pulsars — highly magnetized neutron stars that we detect through their beamed pulses of radiation — lose energy rapidly as they spin slower and slower. When such an object is locked in a binary system with a star or a planetary-mass object, the energy lost by the pulsar can blast its companion, causing it to evaporate. Such systems, termed “black widows” in an acknowledgement of how the pulsar effectively consumes its partner, show optical emission revealing their strong heating. We hope that by studying these systems, we can learn more about the properties of the energetic winds emitted by pulsars, and by measuring the companion dynamics we can determine the masses of the pulsars and companions in these systems. 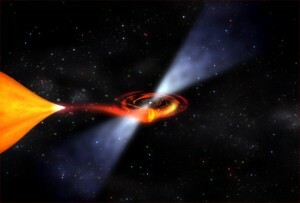 Past models of black widows — necessary to interpret the observations — have generally assumed that the companion’s evaporation was due only to direct heating by the energetic gamma-ray photons emitted by the pulsar. This scenario, however, doesn’t successfully reproduce some of the quirks we’ve observed for these systems, such as very large temperatures and asymmetric light curves. This picture also ignores the fact that much of the pulsar’s spin-down energy — the energy lost as it gradually spins slower and slower — is carried away by not just the gamma-ray photons, but also a magnetized wind of electrons and positrons. 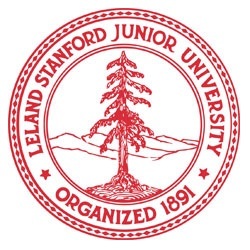 Two scientists at Stanford University, Nicolas Sanchez and Roger Romani, asked the following: how could the particles in the pulsar wind contribute to the heating of a black widow’s companion? 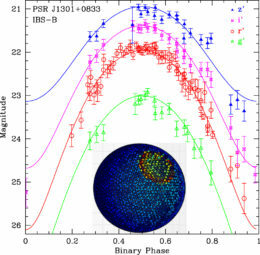 Sanchez and Romani’s alternative model relies on the fact that somewhere between the pulsar and its companion lies an intrabinary shock — the collision point between the pulsar’s relativistic wind and the companion’s ordinary, baryonic wind. The shock is anchored to the companion via magnetic fields, which provides an entry point for shock particles to be funneled along the magnetic field lines onto the companion’s surface. These energetic particles, in addition to the direct irradiation by the pulsar’s photons, cause the heating of the companion that results in its evaporation. 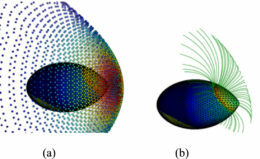 Sanchez and Romani show via simulations that this model can reproduce the observed light curves of several known black widow systems — including the strange features that the direct-heating model didn’t account for. They then use their model to make estimates for the masses of the pulsars and companions in these systems. The authors caution that this model is still incomplete, but it illustrates that other sources of heating are important to consider in addition to heating by photons. Applying this and similar models to more black-widow systems will surely help us to better understand how these predatory compact stars cause their companions’ ultimate demise. See the full article for further references comlete with links. The Galactic Center is an exciting area. In addition to the well-known central black hole and the thousands of stars, there is a curious excess of GeV gamma rays. The origin of these gamma rays is currently unknown. This excess gets a fair amount of attention because it has roughly the same characteristics that we would expect from annihilating dark matter (see this past astrobite for more details). One of the other competing explanations is a population of unresolved millisecond pulsars (MSPs), which would be expected to have roughly the same spectral shape as the GeV excess. Millisecond pulsars are rotating neutron stars that emit a beam of radiation with a periods on a millisecond time scale. They probably form when an old neutron star is spun up via accretion of matter onto it from a companion star. 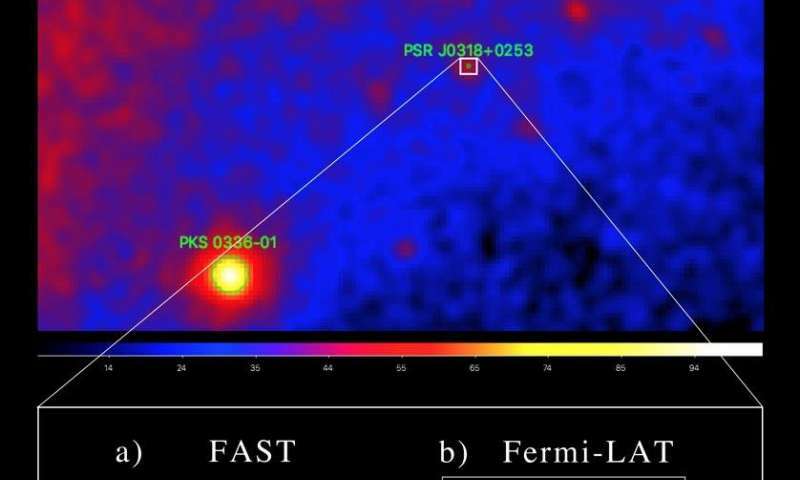 Previous studies have looked at the millisecond pulsar explanation and concluded that if it were true, the inner portion of the Milky Way should have many more bright MSPs than the Fermi Gamma-Ray Space Telescope has already detected. However, this conclusion may suffer from a systematic problem with the measurement of distances to many millisecond pulsars. This is because the distances are often estimated using radio dispersion measurements, which in turn rely on models of how electrons are distributed in interstellar space. If you propagate all the resulting uncertainties through, they can end up being fairly significant! If this potential mismeasurement turns out to be a problem, Fermi might not be sensitive to all of the MSPs responsible for the excess at the Galactic Center. Hooper and Mohlabeng used a different method to describe the characteristics of the Milky Way MSP population which does not use distances based on the potentially problematic radio dispersion measurements. Instead, they determined the luminosity function (or number of stars as a function of brightness) of the MSPs using the best fit to a model describing the MSP population in the Milky Way that they constructed and observations about gamma-ray emission that come from groups of stars orbiting the Milky Way’s center. The parameters in the model were constrained using the few MSPs that have distances obtained via the motion of the stars over a long period of time, which is more accurate. They also looked at three variables that effect the luminosity of a given MSP: the magnetic field, the period of rotation, and the gamma-ray efficiency. The authors used their resulting luminosity function and the probability that a given MSP would be detected by Fermi to estimate how many MSP candidates Fermi should have already detected, and came to the conclusion that Fermi still should have detected significantly more MSPs than it has. However, they are not ruling out the millisecond pulsar theory completely. It is quite possible that MSPs near the Galactic Center are less luminous than those found elsewhere, such as in the Galactic Plane or in globular clusters. One theory has MSPs accumulating in the central stellar cluster/Galactic bulge as the result of the groups of stars getting too close to the central black hole. This would lead to older MSPs in the Galactic center than elsewhere. Since pulsars lose rotational kinetic energy with age, this would lead to lower luminosity MSPs. More studies are needed to get to the bottom of this mystery. Further constraints on the MSP population would give weight to the annihilating dark matter explanation for the GeV excess.